Whether it be in the midst of a summer heat wave or in the throes of a deep winter chill, the thought of a broken HVAC system can induce waves of anxiety even in the calmest of business owners and facility managers. What can take that anxiety level from a 6 to a 10 is when it becomes apparent the equipment isn’t worth fixing any longer and needs to be replaced, as coming up with the cash to replace outdated or broken commercial HVAC equipment can be a big challenge for some commercial businesses. Fortunately, thanks to legislation which took effect earlier this year, commercial businesses now have the opportunity to upgrade to a new HVAC system which provides increased comfort, reliability, and lower energy bills at a much lower cost compared previous years. 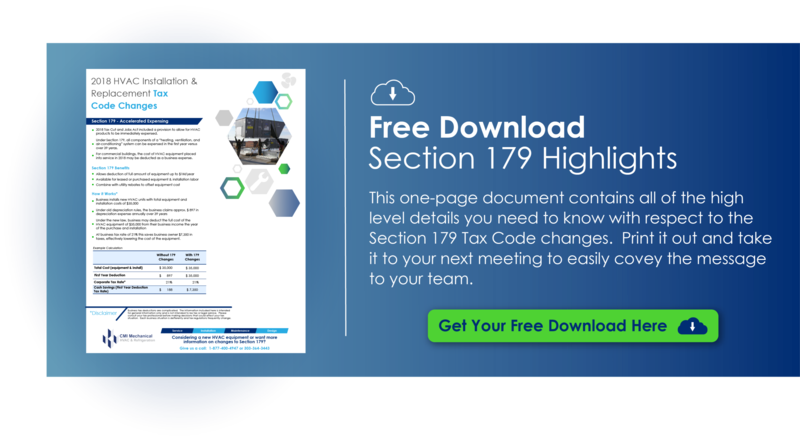 The change to the Tax Code and Job Act includes a revision to Section 179 which allows all components of a “heating, ventilation and air-conditioning” system to be immediately expensed. Prior to the change, all commercial HVAC equipment was considered a capital improvement to a building, which meant it was excluded from Section 179 and therefore slowly depreciated over a 39-year period. This provided little to no tax deduction for spending on the equipment, especially considering the average lifespan of a commercial HVAC system is 10-20 years depending on how well it’s maintained. Now, purchases of both new and used HVAC equipment along with associated installation labor costs can be immediately deducted as a business expense with a deduction limit of $1 million. This change is also available for the leasing of equipment. As an example, let’s say a commercial business installs new heating and air-conditioning units which cost $35,000 including equipment and labor. Under the old 39-year depreciation rules, and the current corporate tax rate of 21%, the business could claim approximately $897 in depreciation expenses annually over 39 years. That equates to roughly $188 in cash savings annually. Under the new law, the business can now claim the entire $35,000 cost from their business income for the year the equipment was installed. Again, at the current corporate tax rate of 21%, this saves the business $7,350 in taxes, effectively lowering the cost of the new equipment to $27,650. This means huge savings, and combined with potential utility rebates on new, high-efficiency equipment, helps give commercial businesses the financial ability to upgrade their HVAC systems. However, keep in mind Section 179 changes every year, and it’s not certain this tax break will be available in 2019. This uncertainty means now is the time if you’ve been putting off replacing aging HVAC equipment but, of course, before you pull the trigger, make sure to do your research. First off, connect with an experienced commercial HVAC provider with a long history of commercial HVAC systems installation. They can help walk you through exactly what your building needs, and whether it’s worth performing an entire replacement of your system. Secondly, business taxes are complicated, and each business is different. The information included here is intended for general information only and is not intended to be tax or legal advice. Therefore, please consult your tax professional before making a decision that could impact your tax situation.